Today I'm sharing a great DIY Back Massage Shirt that makes a great gift whether you DIY it or BUY it! A DIY Gift for Dad is not always the easiest thing to come up with. As another gift-giving holiday approaches, I was looking something fun for LalyDad. 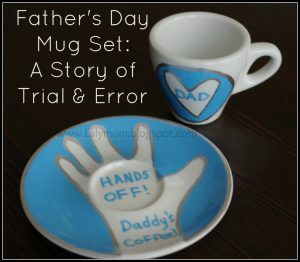 He still uses his DIY Dad's Coffee Mugs and espresso cups so I was hoping to come up with another winner. I think I've got just the thing with this DIY Back Massage Shirt! Just a heads up, affiliate links are used in this post. 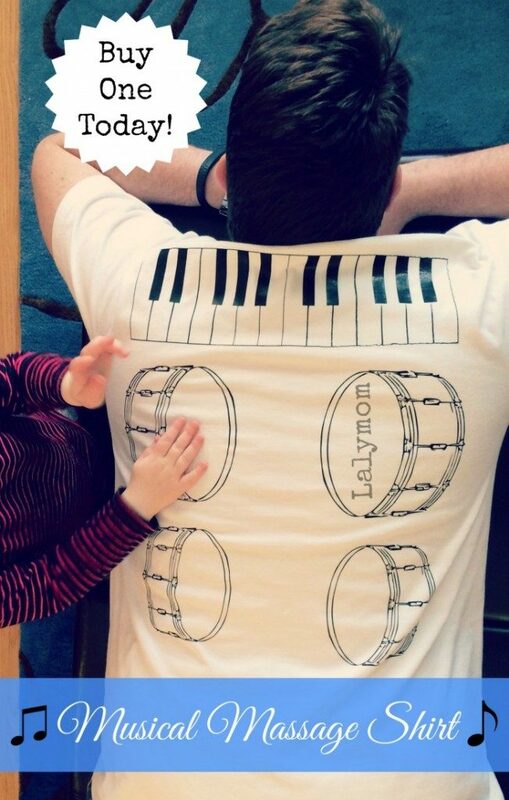 Edited to add: If you are not a DIYer and want to BUY a musical massage shirt, get yours on Amazon today! I loved the idea of this DIY Back Massage shirt that Pink and Green Mama made years ago. I thought the inspiration for it, this car massage shirt from the Blue Basket, looked really nice with the template. 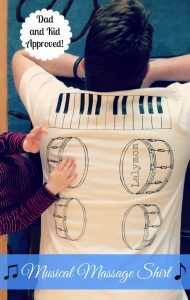 I decided to combine this idea with the fact that my guy LOVES to have dance parties with the kids and I thought, why not make him a Musical Massage Shirt?! My son has a slight obsession with drumming on just about anything, so I really thought this would be a fun way to encourage quality time with him! We probably could have drawn the drums and piano like Pink and Green Mama did- and she has a great tutorial for how to draw on a shirt if you'd like to make one that way. I personally wanted the look of the template for this gift but I love how much work her kids put into the personalized version! I don't have one of those cool silhouette cutters but one of my lifelong friends DOES so I asked her to whip me up some instruments out of some black iron-on vinyl. Patricia of KateDrew Personal Creations is a working mom to two who travels a ton and also manages to squeak in a side business instead of sleep! She has made tons of adorable personalized gifts for her kids and many others so I knew I had come to the right place! I took one of LalyDad's plaint white t-shirts and measured to see how big I wanted the piano and drums (Head over to her Facebook Page if you'd like to buy a set of vinyl instruments OR the silhouette pattern to cut your own!). I contacted Patricia with what I was looking for and thankfully she agreed to make them for me! She lives in another state and she has the aforementioned full-time-job-plus-family combo so I waited patiently (sorta!) for my iron-in vinyl shapes to arrive. They came with detailed instructions and helpful tips to apply the design so now I just needed some alone time with my iron. After prepping the shirt as instructed by Patricia, I aligned the top of the piano just under the collar to ensure I didn't have any wrinkles under the design. The application went pretty well although I probably had my iron set a dot too hot in the beginning. The right bottom corner of the piano got a little distorted but no one else noticed! I also goofed up because the piano piece came in two separate pieces but when I went to grab the pieces the day I ironed them on, the smaller piano piece got left behind! That is okay but if you make one, I originally thought it would be cool for the piano to go the entire width of the shoulders! When it was ready I had LalyDad try it on and give it a whirl. We are always impatient about giving each other gifts! We cranked up the Rock of Ages channel on Pandora and the kids went right over and started drumming! My son was too quick and shifty for photos but dance parties at the LalyMom household will never be the same! Thanks to Patricia for making this special DIY Back Massage Shirt into a reality! BUY YOURS NOW! Two ways to buy: Buy the iron ons from Patricia of KateDrew Personal Creations OR buy it on Amazon! Are you looking for more gift ideas for a loved one? 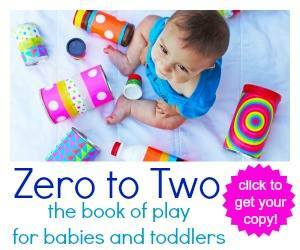 Check out our Father's Day Coffee Mugs and Espresso Set and to encourage more together time with baby, pick up a copy of the new eBook Zero to Two ~ the book of play! I totally played piano on my dad’s back. He could have had this shirt. LOVE it! Those are genius! What a fantastic idea.